I never quite know what to do with kiwis – I like them, but haven’t yet attempted to put them in a smoothie, or do any sort of baking with them. I guess it’s possible, so am going to add it to my list as I don’t want to have a gaping kiwi-sized hole in my smoothie/dessert recipe repertoire, I just need to have a little think about what to make with them. To be quite honest I’d never given kiwis much thought until the other day when Mr H and I were in the fruit aisle of the supermarket and he declared that he loves them which I was definitely never aware of. I guess after almost seven years of dating and a year and a half of marriage there are still things (although not necessarily interesting things) you find out about each other! So with that revelation in mind I decided to come up with a quick and healthy summer recipe that requires very little in the way of prep time so that you can spend more time out in the sunshine enjoying them! 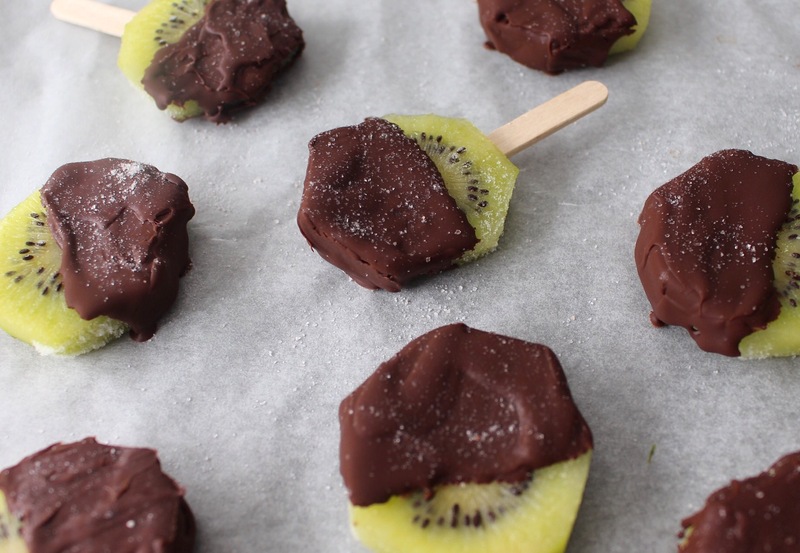 These little chocolate kiwi pops are really tasty, as well as being much less labour intensive than making traditional ice lollies! Plus they’re great for kids and they look super pretty too! Of course they went down a storm with Mr H given that he loves chocolate and apparently kiwis too, and I’m pretty sure you’ll love them as well! Simply peel the kiwis and cut them into slices about 1cm thick, then stick a lolly stick through them and pop them in the freezer for an hour. In a bowl, melt the chocolate over a saucepan half full of water on a medium heat. 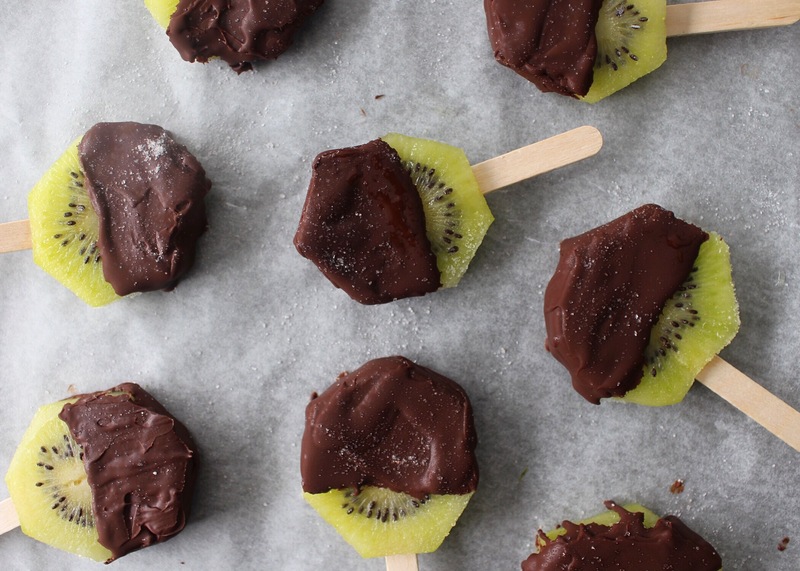 Remove the kiwi pops from the freezer and dip in the chocolate one by one. Sprinkle a little Himalayan salt on top and serve!